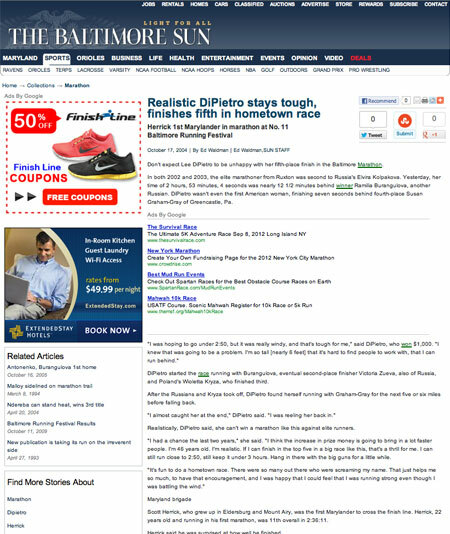 Don’t expect Lee DiPietro to be unhappy with her fifth-place finish in the Baltimore Marathon. In both 2002 and 2003, the elite marathoner from Ruxton was second to Russia’s Elvira Kolpakova. Yesterday, her time of 2 hours, 53 minutes, 4 seconds was nearly 12 1/2 minutes behind winner Ramilia Burangulova, another Russian. DiPietro wasn’t even the first American woman, finishing seven seconds behind fourth-place Susan Graham-Gray of Greencastle, Pa.
DiPietro started the race running with Burangulova, eventual second-place finisher Victoria Zueva, also of Russia, and Poland’s Wioletta Kryza, who finished third. After the Russians and Kryza took off, DiPietro found herself running with Graham-Gray for the next five or six miles before falling back. Realistically, DiPietro said, she can’t win a marathon like this against elite runners. “I had a chance the last two years,” she said. “I think the increase in prize money is going to bring in a lot faster people. I’m 46 years old. I’m realistic. If I can finish in the top five in a big race like this, that’s a thrill for me. I can still run close to 2:50, still keep it under 3 hours. Hang in there with the big guns for a little while. Scott Herrick, who grew up in Eldersburg and Mount Airy, was the first Marylander to cross the finish line. Herrick, 22 years old and running in his first marathon, was 11th overall in 2:36:11. Herrick said he was surprised at how well he finished. Herrick led a parade of eight straight Marylanders to finish, including Baltimore’s David Chalmers (12th in 2:37:08), Columbia’s Mark Gilmore (14th, 2:38:34), Timonium’s Mike Woodman (15th, 2:41:40), Aberdeen’s Bret Mower (17th, 2:42:27) and Laurel’s Jason Grimm (18th, 2:44:49). After more than 13 miles, the half-marathon turned into a full-out sprint to the finish between two Moroccans, Haji Abdrrahim and El Arbi Khattabi, and Kenya’s Samuel Ndereba. Abdrrahim had the best kick, edging Ndereba by two seconds while finishing in 1:03:45. Khattabi was six seconds behind Ndereba. Abdrrahim won $2,000 for first, while Ndereba won $1,000 and Khattabi, who finished 10th in last year’s New York City Marathon, got $500. Russia’s Silvia Skvortsova won the women’s half-marathon in 1:15:30. She beat Kenya’s Teresa Wanjiku, who ran 1:16:32, and Marybeth Ellis of Denver, who finished in 1:17:58. The finish of the 5K race was just as exciting, with Francis Kirwa running 14:33 to beat fellow Kenyan Julius Kiptoo by one second. Andre Gordeyev of Belarus was in the photo, too, finishing in 14:37. The women’s 5K was won by Elana Orlova of Frederick in 16:21. Romanian Denisa Costescu was second in 16:54, and Russian Larisa Michailova was third in 17:09. Michael King of Alglen, Pa., won the crank division of the wheelchair marathon in 1:49:51. King uses a chair that is powered by hand pedals similar to a bike’s pedals. Herado Maldonado of Macungie, Pa., who competes by directly pushing the wheels of his chair, won that division in 2:21:58. Under Armour, the Baltimore-based sports apparel company had about 120 of its approximately 460 employees running in one of the day’s events. That includes founder and CEO Kevin Plank, who ran the half-marathon in “right around 1:52,” he said. It was the second half-marathon for Plank, who also competed in the Escape From Alcatraz triathlon in San Francisco in June. Plank said it’s no surprise that so many of his employees participated yesterday. “We get maybe 500 resumes a week,” he said. “One of the best quotes is anybody who has ever thrown a ball or swung a bat wants to work at Under Armour.